Little animal lovers will love playing doctor to their furry friends with this sweet pet vet set. It comes with everything they need to make sure they’re well taken care of including a stethoscope, syringe, thermometer, scale, x-rays and their very own clinic. The clinic is equipped with a fold-out exam table and four rooms for the patients. Kids get their own set of keys for locking and unlocking the rooms as necessary, and there’s a wise owl in the chimney that pops in and out. Two adorable plush patients — a cat and a dog — are included as well, but kids will be sure to find plenty more patients in their toybox. The roof lifts up to store all of the vet’s tools, and the handle on top makes it easy to take on the road for house calls. Instill a love of nature from a young age with this cool outdoor set for kids. This 10-piece set includes a compass, whistle, magnifying glass, pretend bug, compact bug collector case, hand crank flashlight (no batteries required), and easy-to-focus binoculars with a neck strap. From hiking to insect spotting and bird watching, they will have all the tools they need to explore every facet of the great outdoors. The exploration kit also comes with a carrier bag to take along all of their gear wherever the road may lead them. Whether they’re at the beach, out on a hike, or just in their own backyard, this set will encourage them to look a little closer at their surroundings. Who knows what they may find? Best Game: Peaceable Kingdom Alphabet Bingo! Everyone loves to play Bingo, and this alphabet version takes the class favorite up a notch. Instead of a caller shouting out numbers, players reach into a bag and pull out a letter. If the letters are on their card, they mark them. Once someone gets four in a row, they should “Bingo!” and win. Each space on the cards has a picture of something that starts with the letter. For example “F” has a flower and “O” has an owl, so not only is the game great for teaching letter recognition, but it helps with letter sounds as well. The set comes with six game boards and 72 chips for marking the matches, so there’s enough for the whole family to get in on the action. Fans of the hit show Paw Patrol will get a kick out of this 2.5' tower that let's them recreate their favorite scenes. With the rotating periscope on top they can keep a watch over Adventure Bay, and when trouble strikes the Paw Patrol can alert the troops and race to help save the day, with it's speedy elevator, fast slide and vehicle launcher. Two AAA batteries are included and this set does require some assembly, but reviewers note it takes only 15 minutes to do. If you really want to go big with fun, it’s hard to beat this ride-on pony. Really, what could be more entertaining for a four-year-old than hopping onto this whimsical ride and heading off in search of adventure? Not only is it going to be the cutest ride on the block, it’s also a great way for kids to get exercise. There are no batteries—this rocking horse runs on kid power. Kids rock back and forth, and the pony takes off just like the real thing with the legs and head moving forward and backward in a galloping motion. When one ear is squeezed the mouth moves, and you can hear over 10 seconds of neighing sounds. Kids will love sitting on the plush saddle and sliding their feet into the stirrups, too. It measures 18 inches from the floor to the seat. 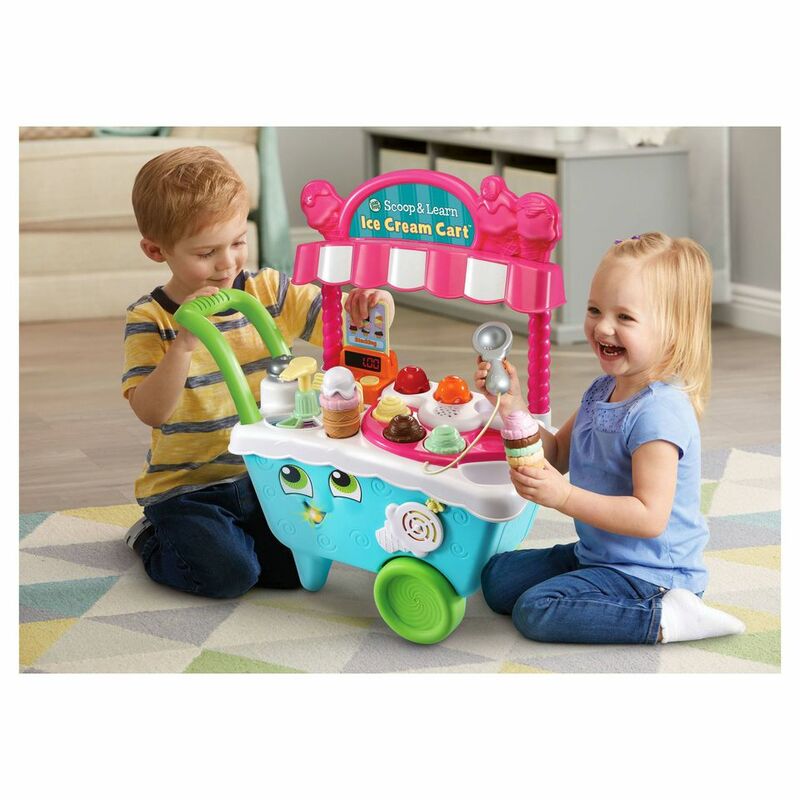 This fun ice cream cart will serve up hours of fun, imaginative play. Kids can play ice cream man/woman as they scoop up delicious treats for their friends, family and stuffed animals. It comes with four flavors of ice cream, three toppings and three flavors of syrup, and they’re all pretend, of course, so there are no sticky fingers to worry about. Six order cards are enclosed for kids to follow, and a magic scooper lets them know if they’re getting the orders right. There’s even a bell to let people know they’re coming or that their order is up. The cart also plays music and features more than 200 fun phrases. There are also seven games kids can play as they serve up the treats that help them develop memory, counting and color skills. This is one seriously cool toy! Take a peek at some of the other best kitchen sets to buy for kids. At this age kids are often counting down the days to special occasions like birthdays and holidays and asking, “how many more days?” over and over again. This great magnetic calendar lets them answer that question themselves. Not only can they keep track of the day, month and year with colorful little magnetic pieces, but they can also record the seasons, their emotions and the weather as well. It can be stuck to a refrigerator or other metal surface or hung on a wall, wherever kids can reach it best. They’ll look forward to filling it out each day, and it’s a great teaching tool for learning about time and weather and a fun way to get them to talk about their feelings. It’s party time! Everyone knows the best part of any party is the cake, and this party cake set lets little ones serve it up anytime the mood strikes. It comes with everything they need including six cake slices ready for cutting, seven candles, 19 toppings, a serving tray and a spatula to dish it all up. The pieces are made of wood, so it’s sturdy, and Velcro tabs make the toppings and candles stay put. It all comes in a wooden storage box for easy clean up and safekeeping between festivities. Future hosts and hostesses will love to have pretend parties and serve their guests their yummy creations. This is a toy that takes the cake… literally. Rub a dub dub, kids will want to stay in the tub with this fun bath toy. At this age, the longer you keep them in the tub, the better, and this submarine spray station will have them begging to stay in for some serious splashing fun. The battery-operated toy (four AA batteries are required but not included) attaches to the tub. Water comes in through the submarine and is circulated up through the diver shower head, which can then be sprayed into two funnels that produce fun, mesmerizing effects with spinning wheels, fountains and googly eyes. Kids will also have fun spraying themselves and other toys as well. Bath time has never been such a blast! We bought four top-rated toys for 4-year-old boys and our reviewers tested them for around 40 hours. We asked our testers to consider the most important features when using these toys, from their durability to their entertainment value. We’ve outlined the key takeaways here so that you, too, know what to look for when shopping. Age range Four-year-olds are at a tricky age, as they’ve officially graduated past the “toddler” stage, yet they might not be ready for big-kid toys. It’s important to check the age rating on the toys you’re considering, as these will help you purchase one that’s appropriate for their level of development. ﻿Educational value Soon 4-year-olds will be headed to school (if they haven’t already), so it’s always beneficial to get them toys that reinforce the important skills they’re learning. You might consider getting them toys that teach basic counting or reading skills or games that help them practice taking turns. Current obsessions At this age, many children start to develop strong opinions and likes. For instance, it seems like just about every 4-year-old absolutely loved Frozen a few years ago. Ask the 4-year-old in your life what they like, and let their answer guide you to the perfect toy to fit their interests. One reviewer also liked that the carry case “can store all the items that it comes with, which is great to keep things tidy and to avoid having anything go missing.” However, on the other end of the spectrum, our testers felt that the toy’s packaging was very difficult to open. One reviewer also wished it came with more than two animals and noted that it was tough to fit those animals in the toy’s various rooms: “You have to really push them in, which can be difficult for toddlers to do (especially if they have to simultaneously turn the key to keep the door closed),” she said.